Oregon OSHA's administrative rules* require employers to post unedited copies of certain documents where the employees can easily see them; for example, at a location where employees report to work each day. 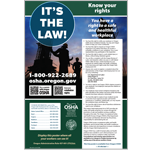 Oregon OSHA's Safety and Health poster must be posted permanently at all worksites. Employers who have more than 10 employees at any time during the past calendar year, and who are not in a designated retail, service, finance, insurance, or real estate industry, must post the OSHA 300A Summary of Work-Related Injuries and Illnesses. Oregon OSHA's, Recording and posting work-related incidents, fact sheet explains this requirement. A Field Sanitation Notice must be posted by employers engaged in the production of food crops intended for human consumption. The Agricultural Labor Housing Registration Certificate must be posted where the employees can easily see it while there is occupancy. Citations must be posted for three days or until the violation is corrected, whichever occurs last. Notice must be posted with the original citation for three days or until the violations is corrected, whichever occurs last. Notice for request for extension of correction date must be posted until Oregon OSHA informs the employer that the extension has been granted or denied. Any notice extending a correction date must be posted until the violation is corrected. A copy of any settlement from an appeal will be posted for 10 days or until all violations have been corrected, whichever occurs last. A copy of a request for reconsideration of a citation, notice or order under the manifest injustice provision of 437-001-0270 must be posted with the citation until the request has been granted or denied. A copy of any feasibility determination relating to engineering controls must be posted for 20 days for review by employees. The name and usual jobsite location of each employer and the employer's representative on each shift who is designated to accompany the compliance officer during a safety or health inspection of the jobsite. The employee's right to report a hazard to the employer's designated representative.